What if you could build two lifts for the price of one longer lift? A handful of ski areas have done it with “up and over” lifts. With this setup, riders load at each end and unload at a ridgetop mid-station. There are obvious cost advantages but also limited locations where such a lift makes sense. Due to multiple load/unload areas more stops and slows can occur. Another disadvantage is that the entire system has to run even if only one side is open. 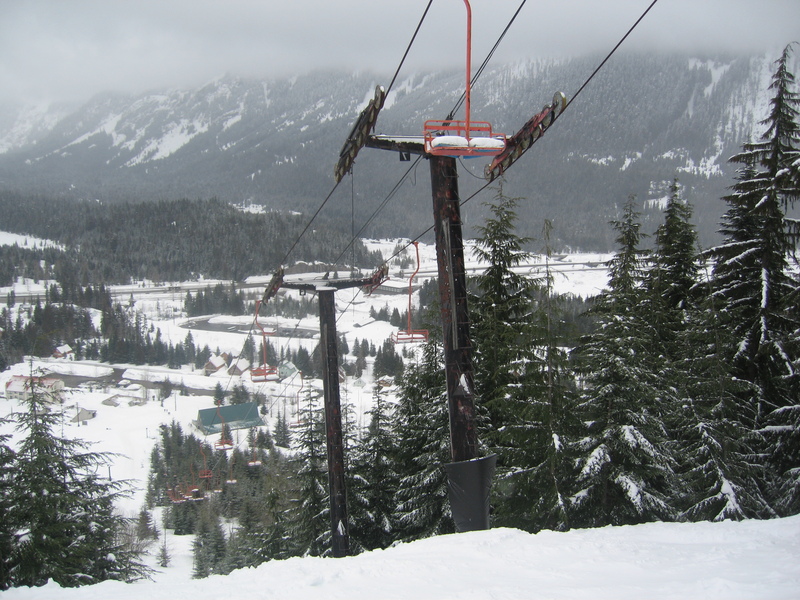 Most up and over lifts are located in the Pacific Northwest. Ray’s lift at Sundance, UT. Robert Redford’s Sundance Resort built a CTEC up and over quad in 1995 to replace two lifts. Skiers who load Ray’s Lift in the main village can unload at the Mont Mountain summit or continue down the other side to the base of the Arrowhead lift. Guests can also load at this end to ride back up to the mid-station. Ray’s lift is a beast – depending on the season it has eight different load/unload points, five lift shacks with controls and 33 towers. 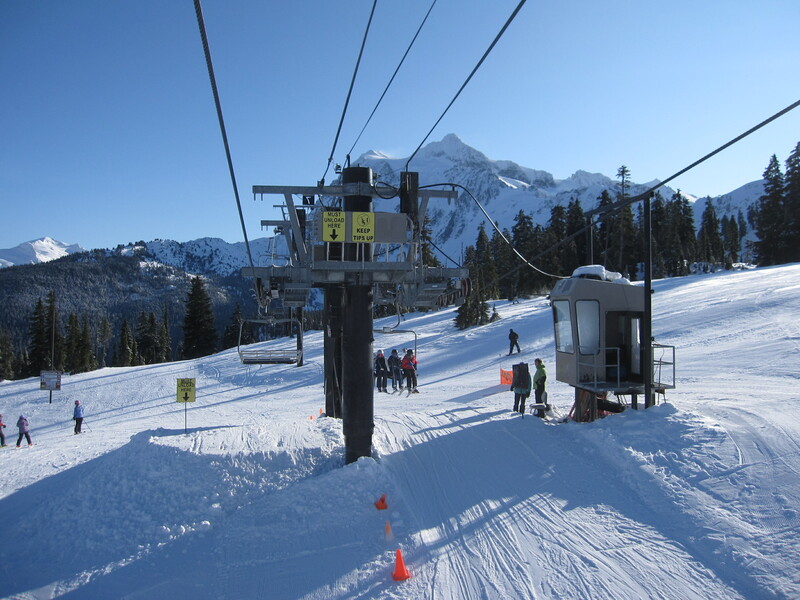 Stevens Pass considers its Double Diamond/Southern Cross system as two separate lifts. Skiers load at both ends and unload on two ramps at the summit which are monitored by one operator. The front side portion, called Double Diamond, is short and steep while the rest of the lift is on the Mill Valley side and dubbed Southern Cross. This system was also built by CTEC in 1987. The combined lift is 5,700 feet long and moves 1,200 people per hour up each side. One operator oversees two unloading ramps from high above at Stevens Pass. Perhaps the most famous of the up and over lifts is the Dinosaur at Snoqualmie’s Hyak. It was built by Murray-Latta in 1965. Over 5,000 feet long, it started at the base of Hyak, crossed the summit and continued down into Hidden Valley. 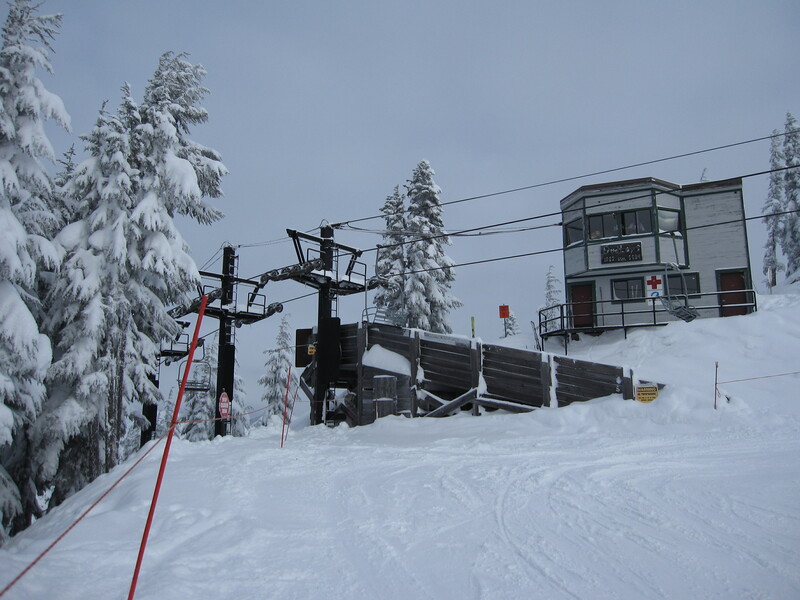 This one lift accessed 100% of the resort’s terrain on both sides of Mt. Hyak. The lift had a rollback in 1971 that injured dozens of skiers. The Dinosaur continued to run until 1988. When it closed, large portions of Hyak became abandoned. 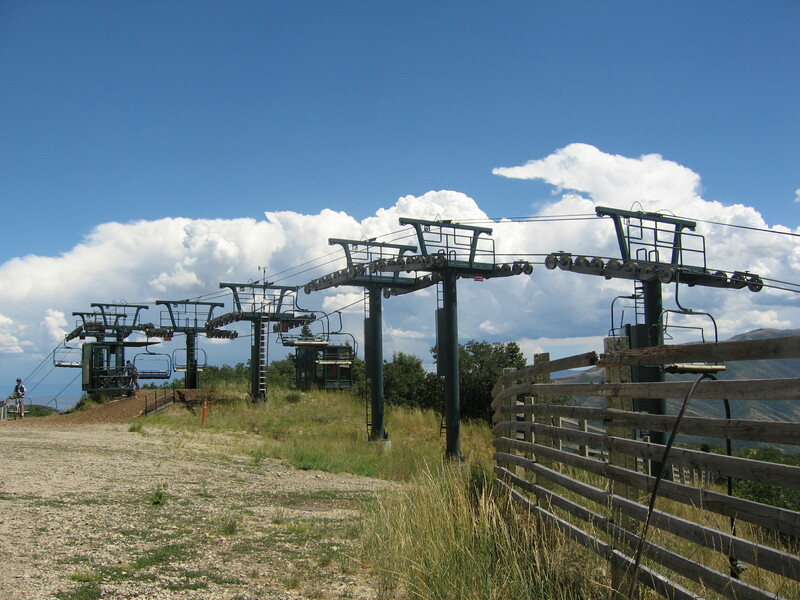 The Dinosaur sat idle until was removed in 2009 and replaced with two used Riblet lifts, a triple on the front side and a double in Hidden Valley. The Dinosaur in 2008 after sitting unused for 20 years. Fortress Mountain, Alberta might have had the most unique up and over lift. Built by Doppelmayr in 1968, the aptly named Curve T-Bar ran one-way in a diamond-shaped loop. Two sides of the diamond carried skiers uphill and the other two sections returned T-bars to the other side. Sadly, this resort closed in 2002 and the Curved T-Bar had reportedly been removed. Mt. Baker’s Chair 3 has had two incarnations with the up and over setup. The first one was a Murray-Latta double from 1968-2006 which was replaced by a Doppelmayr CTEC quad. Like at Stevens Pass, the unload ramps at the top are adjacent and monitored by just one operator. Unloading in both directions at Mt. Baker. Mt. Washington on Vancouver Island has the only up and over lift in Canada. It also has an awesome name – The Boomerang. The drive terminal is midway up the front side of the mountain; skiers board here to access the summit ridge. The lift continues down into the Outback, where skiers load at the bottom to return to the ridge. At the top there are two unloading areas with separate lift shacks and operators. The only up and over lift in the east was built by CTEC in 1978 at Seven Springs. Sunrise and Sunset loaded at the Front Face and North Face respectively and unloaded in the middle. This triple was removed in 2001. Vail has an up and over setup on Golden Peak. Originally it was a 1967 Riblet double that was replaced with a GaraventaCTEC detachable quad in 1996. With a detachable, Vail was able to add a slight turn at the mid-station so that the top terminal could be in a more logical location. Other detachable up and over lifts are the Silver Lake Express at Deer Valley and the Telluride Gondola. If you know of any other up and over lifts I forgot to mention, leave a note in the comments. Whitecap Mountains, WI has a up and over lift, a Hall double, featuring a ‘tall’ lattice tower in a valley between the 2 peaks…. Affectionally called the ‘Gap Chair’. Interesting, I didn’t realize that lift loaded in both directions. The only other Hall with a lattice tower like that was at Crystal, WA but it was wiped out by an avalanche last year. I’ve ridden that Whitecap lift. It’s crazy fun. Each peak (on either side of the gap) have off-ramps in each direction. So you can load at the north base and exit southward at either peak, or load at the south bullwheel and exit at either peak offloading north. Pretty ingenious, really. I have a few pictures of the Seven Springs CTEC Sunrise/Sunset lift taken the year it was installed. As an engineer, I found the concept interesting but the actual implementation was somewhat like a “solution in search of a problem”. It really only operated during peak periods and was only useful in transporting yourself from the parking lot to the North Face and back again. In my mind, this is one of the only questionable decisions made by the original owner, Herman Dupre (of HKD fame). The aunrise/sunset lift lives on. Today, it is used in a more traditional setup by 7 Springs as the Southwind Triple, a homeowner access lift to the Southwind condo development above the Cortina Quad. Little Switzerland in Wisconsin had the only up and over lift I’ve ever ridden. It’s a double. I rode it a decade ago so I dont remember much about it. Correction… the hill has TWO up and overs! I got to photograph one of the longest up and over lifts today on Vancouver Island. Would the Lower Beaver Creek Mountain Express count as an up-and-over in a way, given its profile?